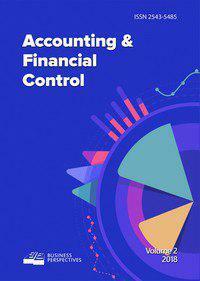 The main aim of the journal is in publishing original scientific research materials from all spheres of accounting and financial control, mainly from the point of view of international practice. The journal is oriented on scientists, professors and students specialized in organization management, and experts specialized in accounting and financial reporting. Topics covered by the journal: National accounting standards, International accounting standards implementation, International financial reporting standards, Economic and financial analysis, Accounting and auditing in enterprise management, Information systems and technologies in accounting and auditing, Decision making methods and models in analysis and auditing, Financial accounting and reporting in taxation, Managerial accounting and financial management, Derivatives transactions and their accounting, Economic information processing systems, Forensic accounting and forensic accounting expert examination, Financial control basic principles implementation, Ethics and corporate culture issues in the processes of controlling and auditing, Financial control methods development, Inner financial control in organizations, State financial control, Financial control innovations in organization.